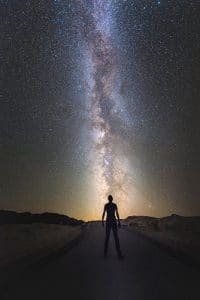 God's Sovereignty: Me and the Milky Way | GetAlongWithGod.comGetAlongWithGod | A blog about discovering a God worth knowing. 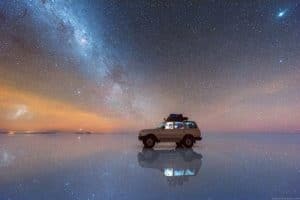 The earth is perfectly positioned in the galaxy for our optimum viewing of God’s expansive creation as well as for resting in the window of delicate balance to sustain life. In the same way, each of us is positioned in our lives so we can perfectly witness God’s divine orchestration of our lives so that we might increasingly come to know Him and love Him. Also we are each resting perfectly secure in the delicate window of His hand to sustain our Life. 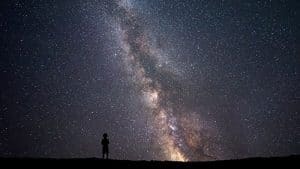 The Milky Way is an incomprehensible 100,000 light years across, and our earth sits in its slim “galactic habitable zone” (ghz)—just far enough from the center that we’re not killed by radiation, but just close enough that sufficient heavy elements needed for life are present. Amazingly this position is also a perfect seat for viewing the rest of the cosmos. “For some reason our earthly location is extraordinarily well suited to allow us to peer into the heavens and discover its secrets,” say the grateful astronomers who authored The Privileged Planet. Imagine, I’m not one millimeter out of His handpicked spot for me to dwell, both globally and individually. Our God is perfectly sovereign over all our lives and each of us has to grapple with this reality of God’s sovereignty. The question? Is He absolutely sovereign over every aspect of our lives? If the answer is no, then He is not sovereign at all. And in light of our lives, each of us is called to make peace with this reality. With the fact of God’s sovereignty in mind, I see why the Apostle Paul teaches us to thank God for everything. I can thank Him because He knows exactly where I am to be and how I am to be. Yes, my life is perfectly orchestrated, even my painful situations, so that I am apt to discover Him and receive my universe. My parents prided themselves on raising me to be an individual. They cultivated my individuality as well as my independence. At times this rearing style felt to me neglectful, but what I have learned is that it was all perfectly orchestrated for me, personally. God’s design of my life perfectly provided an environment in which I could thrive in my circumstances. So the reality is that I wasn’t neglected at all; I was completely cared for and provided for perfectly. It was God’s choice in how He parented me. In reflecting on this, I have also gleaned that it wasn’t what happened to me that hurt me; it was my resistance to what had happened to me that wreaked havoc in my life. We all have the grace to go through all that God allows. This is a bitter pill but sweet reality. It isn’t as if we won’t be wounded by life, but our rigid resistance is more detrimental than what actually happens to us. After making these types of statements about God’s sovereignty, I always go to the worst-case scenario. “What about the severely abused?” I can list a litany of abuses that are currently being reported by our media which cause the skin of even the strongest of us to crawl. But all of what I have said above is still truth. He is sovereign and we have the grace. Our personal world is set up for us to experience God. I don’t say this with a cold heart; I say it with fear and trembling. Does this mean we’re just to lay back and receive abuse? Of course not! What it does mean is that my life and happenings have all been arranged with the goal of my knowing the One who created me. The goal isn’t my happiness; it’s to see God and need Him. Ultimately my life is the preparation for eternity. It is to become increasingly more acquainted with Jesus, whose purpose is why I am here from beginning to end. Whether I am viewing the cosmos or gazing at my living circumstance, nothing happens by chance. It brings me much comfort that He holds the whole world in His hands. His sovereignty is more hopeful than frightening, because even though I may not like it, His character and goodness are set as a seal to the perfection He is orchestrating. Thank you so much , that you have taken the time to answer me almost immediately, and for the links as well. The Lord Jesus looks at your good heart and will reward you! Blessings, guidance and much of His nearness for you, John!